That's really nice. Really nice. Thanks for the feedback. I will be shooting a Ti MTB later today and will use the "Platinum" backdrop per your suggestions. I'll post it here later. Those really are as nice looking as any bikes being made right now. I have three IFs (coupled steel SS MTB for travel, SSR roadbike, and a ti Planet X) you were likely to have welded and craftsmanship and ride quality as is good as anything I've been on. Next frame I have built I'll definitely be looking to you guys. Looking forward to riding with you in April, I'll have to ride by the shop and introduce myself, I'm only a few postal codes away. You should move/copy this to the Showcase thread so there will be a brand specific place to post Firefly pics without having to dig through all the individual frame pics to track it down. Friends don't let friends ride junk! Tyler -- You guys are doing some great work and we are happy that you are sharing your work with us. Keep 'em coming. BTW, I moved this into "The Showcase" to highlight your work more appropriately. All the haters from last year at this time when Firefly was just getting started are appropriately silent right now. I can't think of another builder who put out this much quality, well designed work so quickly. Years ago some of the Fat Ti's and One of Titanium frames were anodized in crazy tie-dye fades. Fades have been big in the titanium jewelry industry and in a way are easier than trying to make a solid area of pure color. Those frames just make me swell. I spend more time than I care to admit admiring your work on your website and on VSalon. Thanks for spending the time to update those sites. Bike geeks like yours truly are paying attention and look forward to your latest designs. Please continue to post here. 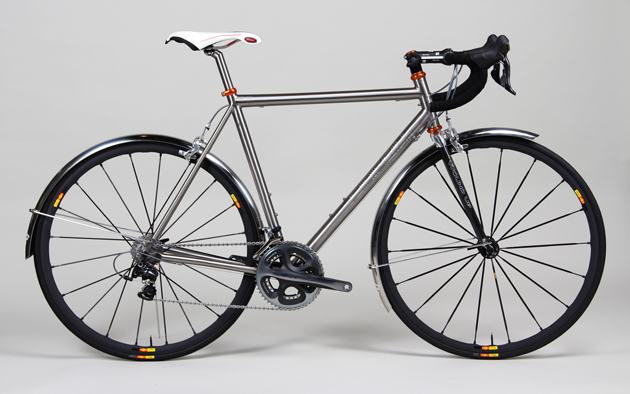 Your bikes really have a distinctive and beautiful style -- clearly purpose-built but classic and very sophisticated. You are next on my list. +1 to this. really great to see a bike with full fenders like that, definitely not a garage queen. keep up the good work, very impressive. in the que is coming up quickly. Can't wait. Those are some LOOOOOONG seat posts. every detail is amazing on your bikes, tyler. thanks for posting. and just one man's vote...but i like your darker, moodier photographs. to my eye they're more distinctive and evocative...part of your 'brand' personality. the brighter, more well-lit shots feel too 'average' for your brand. just my .02. The slightly darker photos look great on a big monitor. On my droid phone, not so much. The lighter background certainly makes the bikes pop from the background and easier to see, but I must admit the dark background looks edgier. Maybe, something in between and maybe try some modified angles on the strobes or crank up the power a bit, or add an extra strobe or two. Part of the fun of photography is figuring out the "best" way, similar to building a frame. Enjoy the journey, and BTW, your frames look awesome.